It won't be long before we meet that bus on our roads again. And when it comes to children on our busy highways, it's never too early to highlight back to school safety. 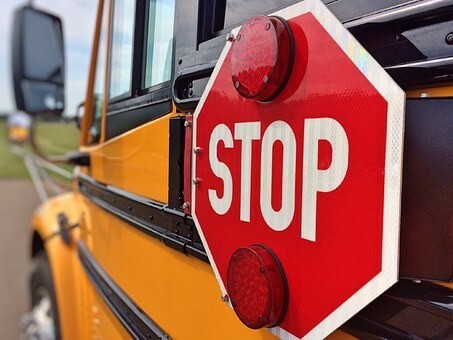 Cars traveling in both directions must stop for a school bus when it's lights are flashing. Your failure to stop may injure or kill a child. At the very least, failing to stop carries a hefty fine, demerit points and likelihood of increased car insurance rates. Children count on their crossing guard to guide them safely to and from school. Those crossing guards count on you to be watchful and stop when needed. Obey the posted speed limits paying attention to reduced speeds in school zones and near playgrounds. Your drive to work will take more time. Plan accordingly and give yourself at least an extra 15 minutes cushion for your commute. Be prepared to brake for children. Keep in mind that children are also walking and biking to school and be vigilant. You are the adult driver. You will likely have the last clear chance to avoid a tragedy. Drive defensively. We have one job. Driving our car demands our full attention. Texting, talking on the phone, setting the GPS and eating breakfast behind the wheel, is distracted driving. It takes our eyes and minds off the road for too many precious seconds. Just make safe driving your priority. Back to school can sneak up on the best of us. Be ready for your first encounter with that school bus. Know that once August rolls around, all drivers should be ready to share the road with the school bus. Our children's safety on the roads is everyone's priority. Make sure you are prepared for back to school.